Units can be provided in accordance with ASME Sect. VIII, Sect. V and Sect. IX of the Boiler and Pressure Vessel Code, TEMA, API, HEI, and 3A Standards. Capacity : 0.2m2 to 100.0 m2 in M.S. 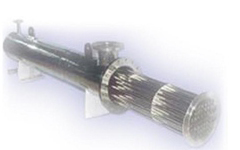 S.S. 304, S.S.316, Material shell & Tube type, Higher capacities can also be provided. Applications : Chemicals, Pharmaceuticals, Dyes & Intermediates in GMP & Non GMP Models.